﻿ Bristol Radiator Covers Home Page - Why Radiator Covers? 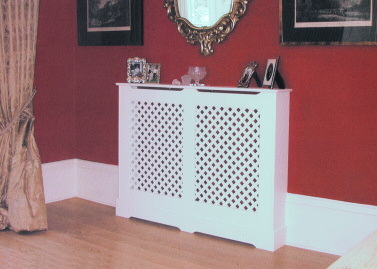 Radiator cover with a double panel painted cover with a painted single overlaid lattice. This radiator cover hides an unsightly radiator in an otherwise elegant room. Are radiators taking up your valuable wall space? Never enough surfaces in your home to display the things that make it uniquely yours? Not only will our radiator covers enhance your home, looking more attractive than a bare radiator, but you will be gaining a useful shelf for ornaments, photographs, candles, books, or vases of flowers. 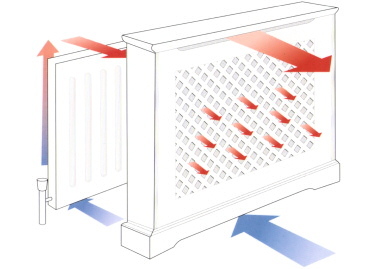 Bristol Radiator Covers are designed to maximise heat efficiency, with the air gap at the bottom and the vent at the top allowing for natural convection, directing the warm air towards the centre of the room, rather than the air going straight up the wall towards the ceiling as with an uncovered radiator. Bristol Radiator Covers have a low surface temperature, protecting against the possibility of radiator burns, a consideration if there are children or elderly people in your home. 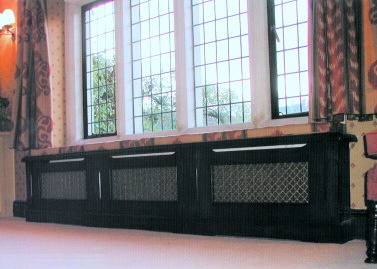 Triple panel radiator cover in dark oak, with brass diamond grille. This dual purpose cover also acts as comfortable window seat. Our radiator covers are stable under heat and humidity and will not warp. The front panel is easily removable for access to the valve.